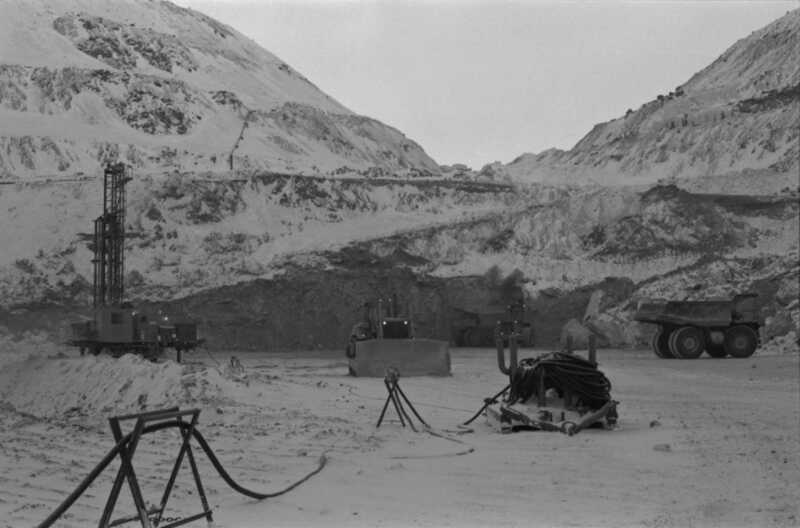 Photograph depicts blasthole drill on left, bulldozer in centre, and shovel loading ore haulage truck in background. Second haul truck is semi-visible on far right. Hose equipment can be seen in foreground. Item is one of 72 photos taken together, generally depicting the workplace at Cassiar, B.C. Photos have been rehoused, arrangement imposed by archivist. Item is part of the Cassiar Asbestos Corporation Ltd. fonds. Image is one of 72; descriptions available for items 2000.1.1.3.19.180 - 2000.1.1.3.19.226. Original accession no. : 2000.1.0685.026 [this photograph came from box 685].